Twenty years since the birth of South Africa’s democracy, graduates of Notre Dame’s LL.M program in International Human Rights Law with the Center for Civil and Human Rights returned to Notre Dame to discuss their efforts to maintain and improve the country’s developing constitutionalism. The group participated in a series of special events and lectures over the span of two days with the central theme Engaging Justice in South Africa. Madlanga, who was appointed to South Africa’s highest court for a 12-year term in 2013, visited the Law School as the Judge James J. Clynes, Jr., Visiting Chair in the Ethics of Litigation within the Judicial Process. He co-taught a course on comparative constitutional law with Concurrent Professor Emeritus of Law Donald Kommers. 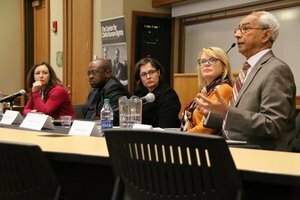 The struggle for restorative justice, reconciliation, peace building, and the South African Constitution were the focal points of a one-day symposium hosted by Notre Dame’s Journal of International and Comparative Law as well as several other events hosted by the CCHR and the Law School. South Africa’s quest for freedom and justice has played out on the world stage. In 1990, the world’s attention was focused on South Africa as Nelson Mandela was released from prison. South African citizens held their first free election — choosing Mandela as their first black president — and drafted their initial constitution in 1994. Today all South Africans can vote, own property, and live in a society marked by increasing justice and equality. To guard the country’s fledging democratic state, the country established the Chapter 9 institutions — including the Public Protector, South African Human Rights Commission, Commission for the Promotion and Protection of the Rights of Cultural, Religious and Linguistic Communities, and the Commission for Gender Equality,— which are independent of the government, subject only to the Constitution and the law, and report annually to Parliament. The group of LL.M. alumni agreed that while South Africans have much to celebrate in their years since apartheid they also face real challenges to ensure the democratic institutions they fought hard to establish aren’t undermined. Notre Dame’s legacy of engagement in South Africa reaches back to the late 1980’s when then University President Rev. Theodore M. Hesburgh, C.S.C., at the request of South African jurist Richard Goldstone, created the Center for Civil and Human Rights LL.M. Program in International Human Rights Law specifically to help equip that country’s human rights lawyers to advocate for justice. To date, Notre Dame has graduated 36 South African lawyers through the LL.M. program. Originally published by Lauren Love at law.nd.edu on April 27, 2016.